90 minutes of accredited professional development for teachers presented by Dr Ros McMillan. Suitable for early primary teachers who are looking to include authentic music experiences in their teaching program. 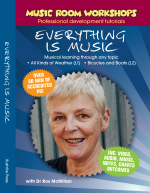 Ros McMillan is the author of well known resource ‘Music Time’, and an acclaimed international presenter. Join her as she shows us that everything can be turned into a musical experience! No experience is required for this journey and all instructions, charts, music and audio are provided. 2 units for level 1 and level 2 students.